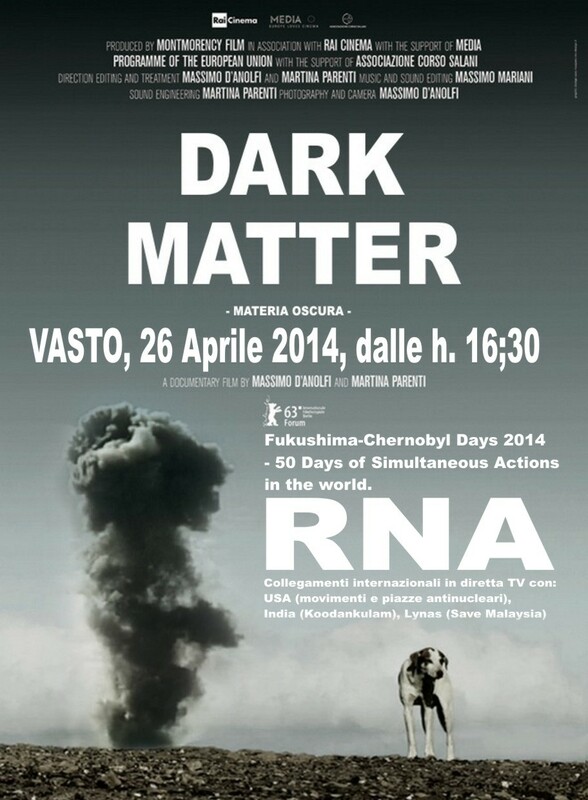 Vasto - Chernobyl Fukushima Day 2014 - Proiezione di Materia Oscura, il film di Massimo D'Anolfi e Martina Parenti. Dalle h. 16:30 - SABATO 26 Aprile. ► Watch the BANNER better HERE. DÍAS INTERNACIONALES DE MOVILIZACIÓN CONTRA LA ENERGIA NUCLEAR. Fukushima-Chernobyl Days - 50 Days of Simultaneous Actions in the world. "MATERIA OSCURA"(DARK MATTER) - Lanciato al Festival Internazionale del Cinema di Berlino. 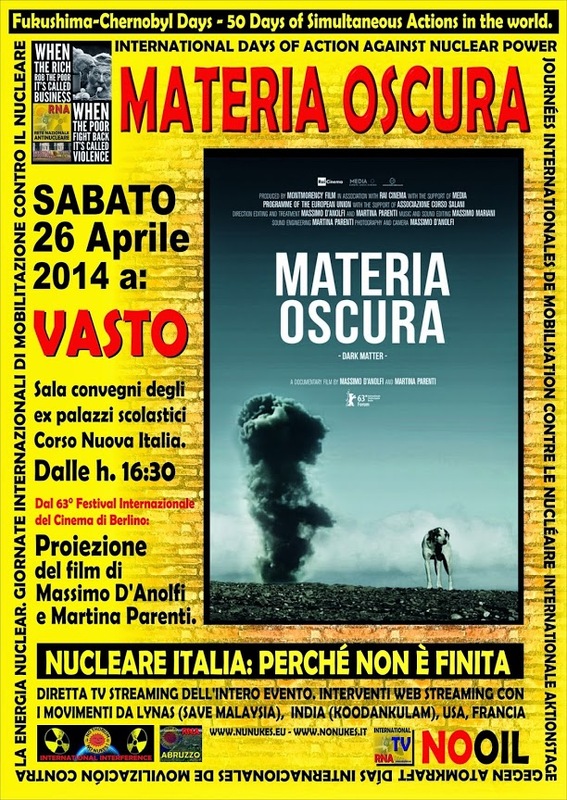 Film di Massimo D'Anolfi e Martina Parenti per l'Edizione Italiana del Chernobyl Day 2014. Collegamenti in video conferenza da India, Malaysia, USA e Francia. "L’EREDITÀ NUCLEARE: SOGIN, UN’ESPERIENZA ALLARMANTE"
- che ci illustrerà come, questa volta, nonostante i referendum... le LOBBY non aspetteranno altri 25 anni prima di tornare alla carica sul Nucleare. ✔ Interverranno inoltre Ezio Palumbo e Massimo Greco (RNA International). ☢ La Vicenda del deposito "Unico" Nazionale per le Scorie ed i traffici italiani di materiale radioattivo. 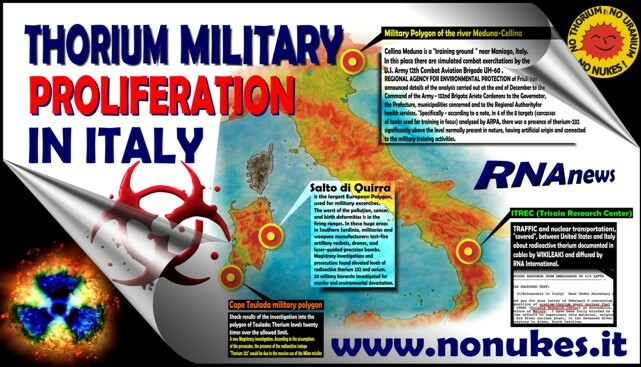 ☢ La mitologia complottista del "Nucleare verde... al Torio" e le vicende giudiziarie in Italia (e non solo) che la smentiscono. ☣ L'iniziativa non ha scopi elettorali ed è completamente sganciata dalle priorità stesse della campagna elettorale 2014. ★ RNA È l'UNICA realtà che coniuga resistenza ambientalista Contro le produttività NOCIVE con la messa in discussione del modello di produzione borghese e dei rapporti di forza Capitale-Salario. ★ Dal 24 Settembre 2009: Questo è il taglio e la motivazione RIGIDA e COERENTE che DETERMINA ogni nostra "AZIONE", scelta di Priorità, pubblicazione, "condivisione" o presa di posizione. Daily Herald. $224 million to be paid to EPA for clean-up of thorium contamination at the Welsbach Superfund Site in Gloucester, NJ. "Point" of the event will be a public projection of the movie "Dark Matter" [about thorium radioactive weapons and depleted uranium] and "All the Nuclear accidents after Fukushima (2011-2014)". Another part of the Debate will be about "The Italian Case after the referendum". Join the FB Event Page HERE, where you can find, also, more info about the Live Streaming channel. Dark Matter (Materia Oscura) adopts that non-interventionist style currently in vogue on the documentary circuit in order to present a limited but occasionally absorbing ground-level snapshot of the Salto di Quirra Interforces Test Range, the largest missile test base in Europe, which is situated on the Sardinian coast and has been used to test new-generation weapons since 1956. Join the FB Event Page HERE, where you can find, also, more info about the Live Streaming channel. Trialer of this movie is available HERE. 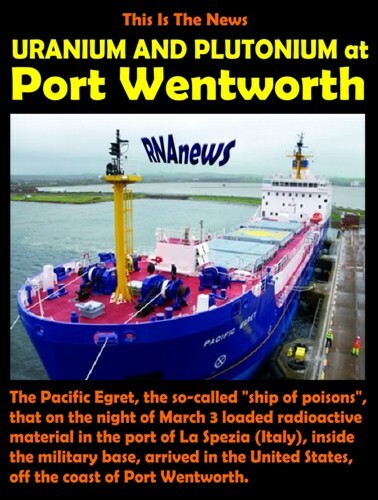 Canada, USA - Port Wentworth: Uranium and Plutonium from Italy". According to Tom Clements, a nuclear materials expert and adviser to the South Carolina Chapter of the Sierra Club, says without a firm “disposition pathway” for the civilian MOX and separated plutonium arriving from foreign nations, local residents fear the Savannah River Site will be left “holding the plutonium bag. Ottawa Citizen reported in March 30. The nuclear fuel carrier Pacific Egret slipped into the harbour at Charleston, South Carolina, on March 19 and unloaded a top-secret cargo at the port’s Naval Weapons Station. Read More HERE. By Libbe HaLevy. 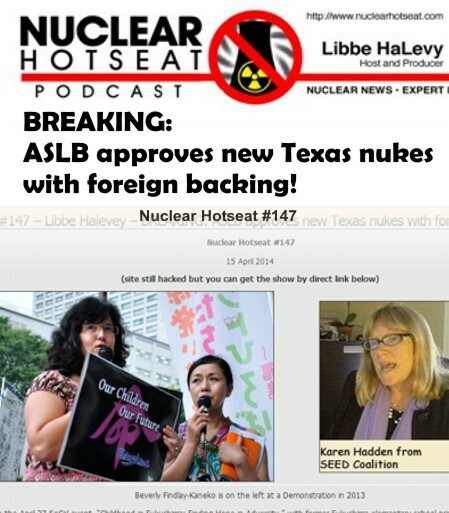 Interviews with Karen Hadden (SEED Coalition) and Massimo Greco (RNA-www.nonukes.it). Read More HERE. $224 million to be paid to EPA for clean-up of thorium contamination at the Welsbach Superfund Site in Gloucester, NJ. Daily Herald. 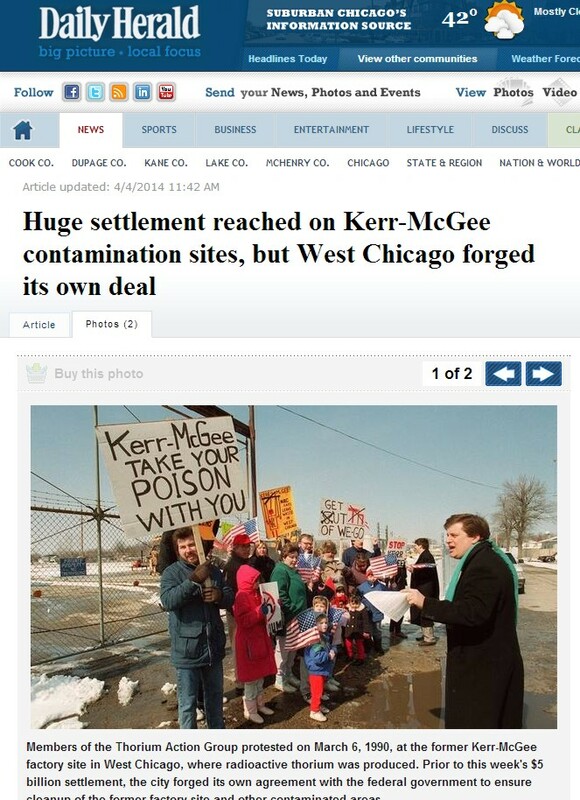 A former Kerr-McGee gaslight mantle factory in West Chicago became notorious in the 1990s for burying radioactive thorium, and the contamination spread to houses and school yards, Reed-Keppler Park, a sewage treatment plant, Kress Creek and the West Branch of the DuPage River.. Read More HERE.